Music, Technology & Education | D.A.R.E. The use of technology in music and education can no longer be described as a recent development. Music learners actively engage with technology in their music making, regardless of the opportunities afforded to them in formal settings. This volume, co-edited by DARE member Dr Evangelos Himonides, draws together critical perspectives in three overarching areas in which technology is used to support music education: music production; game technology; musical creation, experience and understanding. 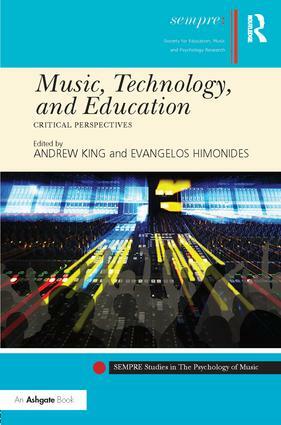 The fourteen chapters reflect the emerging field of the study of technology in music from a pedagogical perspective. Contributions come not only from music pedagogues but also from musicologists, composers and performers working at the forefront of the domain. The authors examine pedagogical practice in the recording studio, how game technology relates to musical creation and expression, the use of technology to create and assess musical compositions, and how technology can foster learning within the field of Special Educational Needs (SEN). In addition, the use of technology in musical performance is examined, with a particular focus on the current trends and the ways it might be reshaped for use within performance practice. This book will be of value to educators, practitioners, musicologists, composers and performers, as well as to scholars with an interest in the critical study of how technology is used effectively in music and music education.